A few days ago, in the middle of the current IDC, I received the updated and new IDC training materials. Remember the Course Director update in Phuket that I posted about in December last year, that update was all about the new materials and curriculum that we can teach now. Alas, unfortunately not for this current IDC, that's the last IDC following the now almost 'old' curriculum. My next IDC, scheduled in April will follow the new outlines, pretty exciting and I'm looking forward to teaching that. There are plenty of new materials available and the Instructor Manual is one of them, as shown above. It's now just 160 pages in an A5 binder with zipper, the same size as a PADI logbook. A new thing about this Instructor Manual is that Divemasters now are required to own a copy. 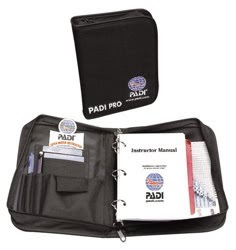 The Instructor Manual is now available as a free download for PADI Members at PADI's Members website. Another new item is PADI's Guide to Teaching, which replaces the Candidate Work book and is an extension of the Instructor Manual. This new product also includes teaching techniques and recommendations previously found in the instructor manual. This shows the new Instructor crew pack, although the pack bag is not necessarily included, only at an extra, marginal charge. Besides the usual slates and exams, it now also includes a CD-rom with three books; Best of the UJ, Children & Scuba and the Business of Diving. 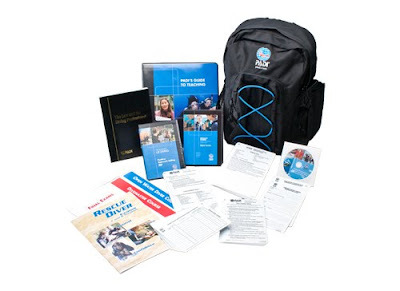 The Positive Approach Selling DVD is part of the crew pack and the Instructor Specialty Manual on CD Rom is included. Here's a glance at the new design of the IDC slides. I had a peak into it and will look more into it once this IDC is over and I have a bit more time. Come and see me for the April IDC on Koh Samui!